Comments: A very cool cartridge based system, that is already a piece of history, as it is no longer in production. 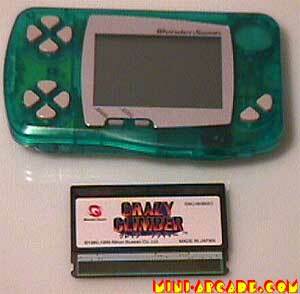 Very compact, a nice screen (even though it is only greyscale), and I like the sound chip too. The color of my unit is skeleton green. Notice how the game can be played horizontally or vertically. 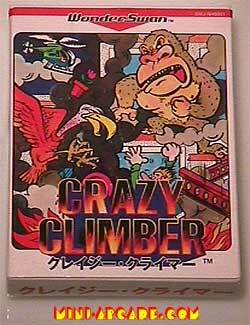 CRAZY CLIMBER - A must have! Play a classic version, which is almost identical in sounds and graphics, or play an updated version. The button configuration and screen direction is perfect for this game. 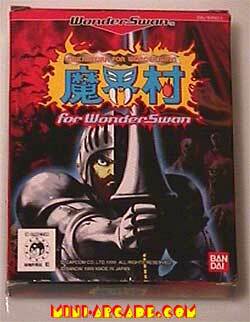 This game was sold separately, as the wonderswan did not come with any games. 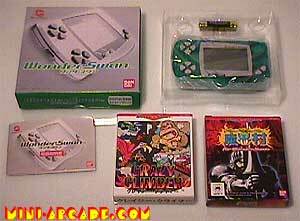 GHOULS AND GHOSTS (aka Ghosts and Goblins) - Another must have! The sounds and music are superb. The graphics and logic are complex enough to sometimes cause screen lag, but other than that I really like this port.